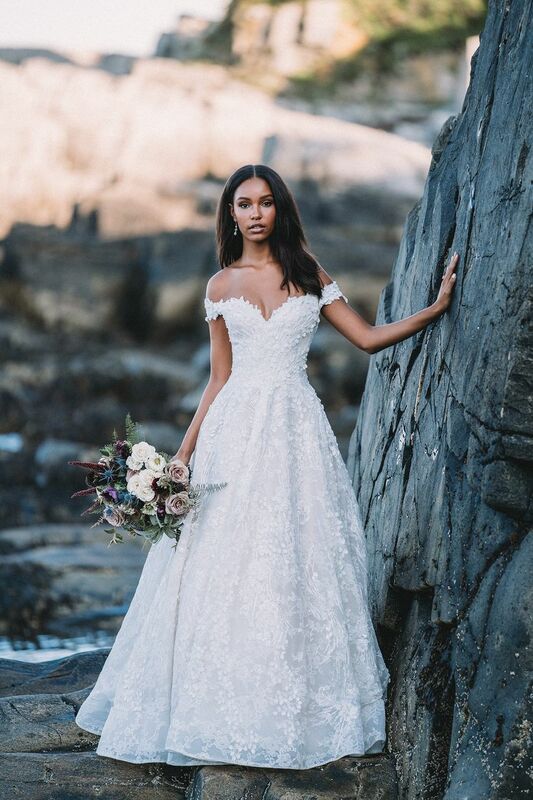 On the hunt for your dream gown? 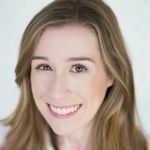 We're discussing the most popular wedding dress necklines to help you ace your bridal shopping experience. 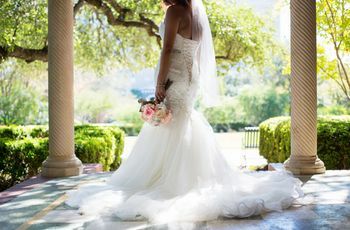 Before you shop for your dream gown, it's helpful to brush up on the most popular wedding dress necklines — strapless, sweetheart, illusion, and so on — to find the one that will best flatter your body type, complement your personal style, and ultimately make you feel incredible on the big day. 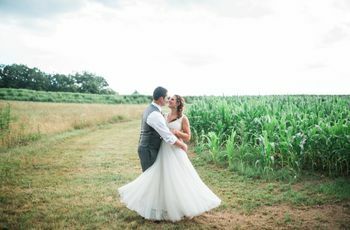 But unless you're already an expert on bridal fashion terminology, keeping track of all the different wedding dress necklines might be easier said than done. That's where this handy guide comes in! 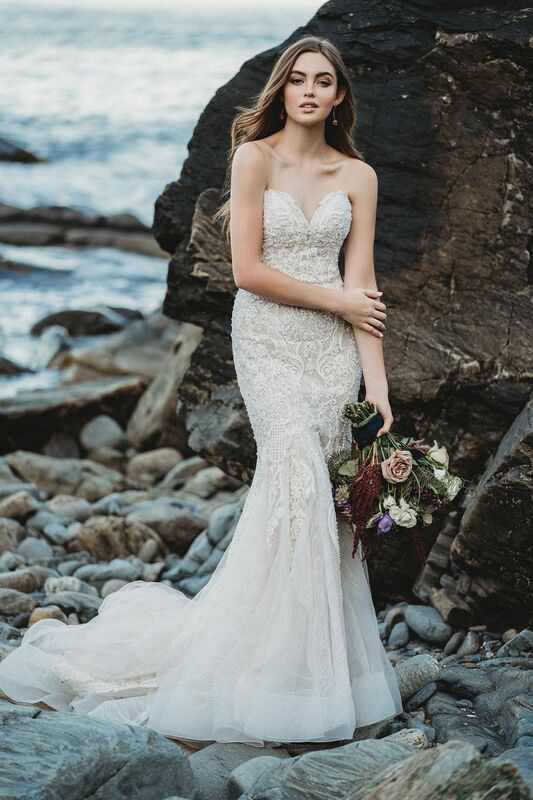 While we definitely recommend trying on a variety of necklines during your bridal appointment, this go-to guide, which features gowns from Allure Bridals, will help you narrow down some of your initial wedding dress neckline faves. Learn more about the most popular wedding dress necklines right here. 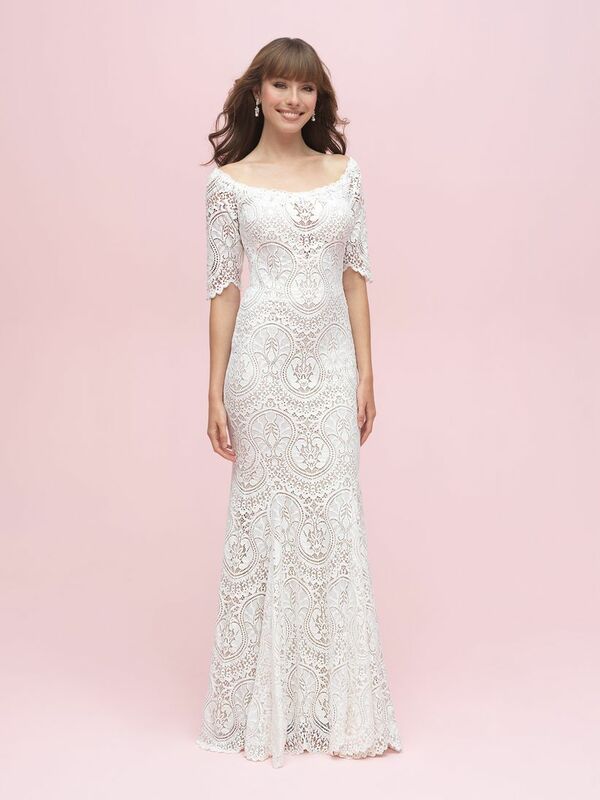 This neckline dips into a "V" shape in the front and is usually paired with long sleeves or straps, as seen on this lace sheath gown (Style 9624). V-necklines are often a slimming option for many body types. This wedding dress neckline is similar in appearance to a turtleneck. A high neckline is a great option for brides who want to maintain a bit of modesty, but illusion netting and sheer details — as seen on this vintage-inspired wedding dress (Style 9567) — allow you to show some skin, too. Also known as a boatneck, the bateau neckline features a wider opening and skims the tops of your shoulders, allowing your décolletage to shine. 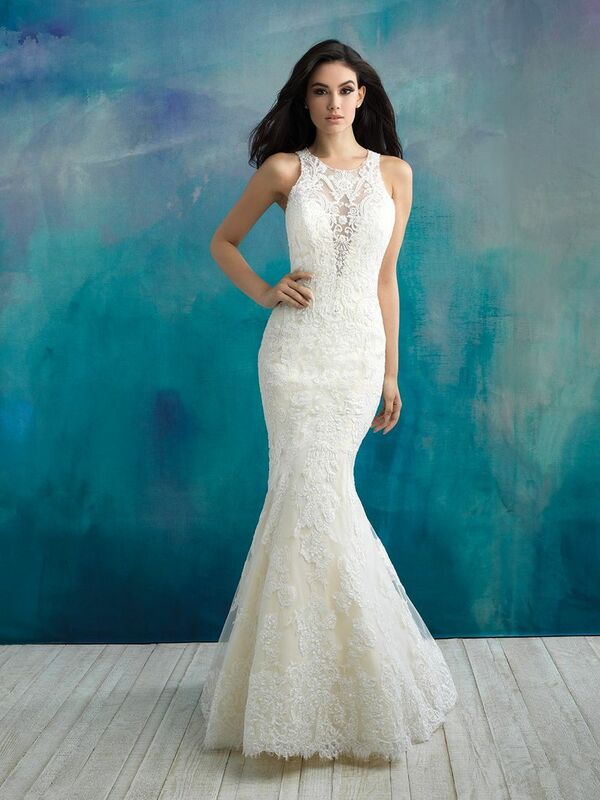 It pairs beautifully with sleeves, as seen on this lacy number (Style 3209). This neckline is also a royal favorite — the Duchess of Sussex opted for an elegant bateau neckline for her walk down the aisle. A neckline that features sheer fabric or lace along the top part of the bodice. It gives the illusion of a strapless dress (hence the name) but offers more coverage and support. We're loving this gorgeous off-shoulder illusion gown (Style 9474). This fashion-forward, asymmetrical neckline features a single strap that drapes diagonally across the chest. 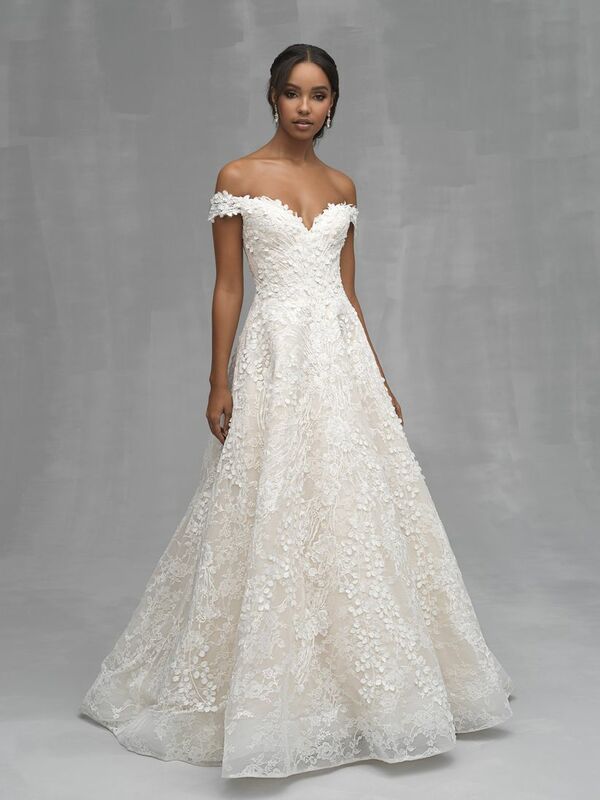 Depending on the style, a one-shoulder gown can feel glamorous, modern, or totally romantic, like this floral appliqué option (Style MJ457). This neckline shows off the collarbones with straps that rest at the tops of your arms, just below the shoulders. It's an ultra-romantic style, especially when paired with a ball gown silhouette like this (Style C520). We love off-the-shoulder necklines with loose updos and statement earrings. As the name implies, you won't find any straps here! 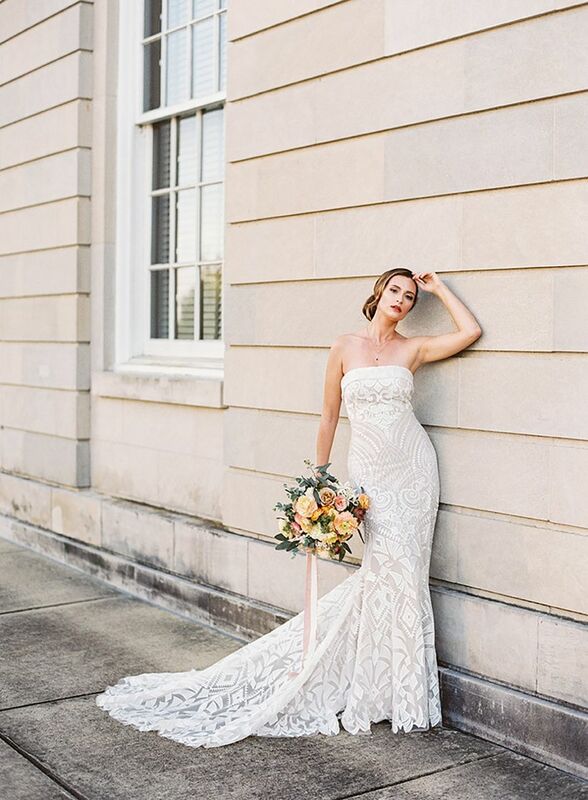 A traditional strapless neckline goes straight across the chest, creating a clean, sophisticated look, as shown on this geometric embroidered wedding dress (Style MJ401). For a similar option, check out the sweetheart neckline. A neckline featuring thin, barely-there straps. This option is excellent for brides who want to show off their arms or rock a wedding dress with a fabulous illusion back, like this architectural A-line gown (Style 9620). This wedding dress neckline is rounded in the front, creating a flattering, feminine effect. Draped chiffon sleeves, like the ones on this crepe gown (Style MJ408), add an ethereal, fairytale vibe. A halter neckline has straps that tie, snap, or hook at the back of the neck, making it a great pick for brides who want to expose their shoulders. Halter necklines are stunning with backless wedding dresses and plunging v-necklines, as proven by this dramatic A-line gown (Style 9617). This wedding dress neckline is rounded and typically sits higher on the collarbones. It's sometimes beaded to mimic a necklace (hence the name "jewel") but looks just as fabulous without sparkling embellishments. Just take a look at this chic jewel neckline featuring illusion lace (Style 9504). A strapless neckline that dips in the front, creating an outline that resembles the top of a heart shape. Sweetheart necklines are ideal for giving the illusion of curves (or flaunting what you already have) and look incredibly romantic, especially when paired with lace appliqués and tulle à la this fit-and-flare dress (Style 9601).